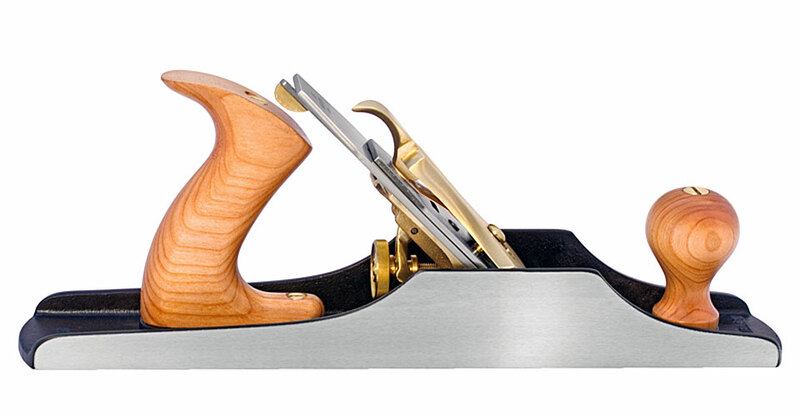 Jack Planes excel at a large variety of tasks, such as removing milling marks or the scallops of a scrub plane. The No. 5 is built for hard work and will quickly flatten surfaces for the finer set planes to follow. Blade is 2" wide x .125" thick. Lie-Nielsen Bench Planes (except for the No. 1) are based on the Stanley Bedrock-type planes. Bedrocks were Stanley’s top line of Bench Planes, heavier and better made than the standard. In addition, the construction of the frog is unique — it features a fully machined fit between frog and body, adjustable from the rear without having to remove the blade and cap. This allows you to easily change the mouth setting from a coarse to fine cut for difficult woods or fine smoothing passes. All Bench Plane blades are bedded at 45° with the bevel down. To advance the blade, turn the adjuster nut clockwise. It is always a good idea to finish adjusting the blade by a forward adjustment to take up backlash and to prevent the blade from moving. In order to be able to adjust the blade easily, do not overtighten the lever cap screw. To adjust the mouth opening, loosen the two locking screws at the back of the frog; then turn the middle adjuster screw. Observe the opening in front of the blade. When it is correct, set the locking screws again. Our Chipbreaker is 1/8" thick. The raised lip under the bevel of the chip-breaker is back beveled 1° to ensure that the leading edge contacts the blade firmly. You should never need to dress this surface, but if you do, use a very fine stone and be sure to maintain the angle. The 25° bevel may be honed occasionally. For general work, set the end of the chipbreaker about 1/16" from the cutting edge of the blade; for the finest smoothing work, set it closer to the edge. Iron tools are cast from Ductile Iron, a very strong alloy that will take a lot of abuse. These castings are fully stress relieved, a process that removes inherent stresses and ensures that the tool will remain flat and true. The blade is A2 cryogenically treated Tool Steel, hardened to Rockwell 60-62 and double tempered. Our heat treating technique ensures that the blade will take and hold a very fine edge for a long time. After heat treating, the blade is fully surface ground on the top, back, and cutting edge, giving a smooth, flat surface that will take a mirror finish very quickly. The thick blade provides solid chatter-free cutting. The cap is Manganese Bronze. This plane comes with a new and improved Stainless Steel yoke installed in the Frog. The Steel is stronger than Bronze and will be more resistant to wear over time. All Bench Plane bodies are surface ground flat and square to a tolerance of .0015". Depending on how much use your tool gets, an occasional light sanding with 320 grit or finer wet/dry paper on a flat surface will keep the sole in as-new condition. Tools with Iron bodies should be kept lightly oiled or waxed to prevent rust. We recommend Jojoba Oil, a plant based oil product that is non-toxic, odor-free and easy to use. Also, in our shop, we use a fine abrasive handblock to remove any light surface oxide from tool bodies and blades. Jojoba Oil and abrasive handblocks are available from us. A light oiling on the threaded rod, the Brass adjuster nut and the lateral blade adjustment lever will keep them moving freely. Many people like the patina that Bronze gets with age and use, but if you wish to keep the finish bright, a little brass polish is in order. The Cherry knob and handle are oiled and buffed with wax to produce a natural finish. Wipe with oil as desired to refresh. No. 4 or 5 Bench Plane Blade, 2"
No. 4 or 5 Chipbreaker, 2"